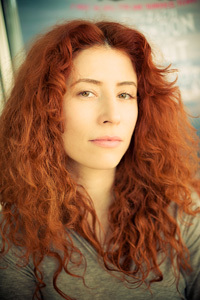 Israeli-born Alma Har’el’s first feature film, Bombay Beach, premiered at the Berlin International Film Festival this past winter to quiet but consistent accolades, and will have its American premiere in competition at the Tribeca Film Festival in New York this week (April 20-May 1, 2011). 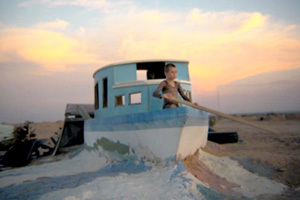 Shot in the surreal environs of the Salton Sea, a man-made body of water that sits in the middle of the California desert, the film itself has plenty of surreal aspects of its own. It is, in certain respects, a recognizable vérité piece about several people who inhabit the seaside town of Bombay Beach and nearby community of Slab City. But Har’el is also an award-winning music video director and so has collaborated with her subjects to tell part of their stories in sequences where they interpret their lives through dance, accompanied by the haunting voice and horn of Zach Condon of the band Beirut. In an article for New York Magazine in 2006, a very young (and exceedingly stage-frightened) Condon said of his music, “It’s impossible for me to play these songs and not feel joy.” It’s impossible to listen to them without experiencing loads of it, as well. The film also contains some musical selections from an upstart named Bob Dylan. Bombay Beach is a tremendously moving piece of cinema—human scale, intimate and warm—with gorgeous cinematography by Har’el, and tender and playful dance sequences choreographed by Paula Present, a long-time collaborator of the director. Hammer to Nail: Without any confines of traditional documentary storytelling, you went about making Bombay Beach in a very low-key way, working intuitively and almost completely on your own. What are you learning about this film from audiences who are now sharing with you what they think about this unique collaboration that took place between you and your subjects? Alma Har’el: I find myself quieting down quite a bit and listening intently to what people have to say. And in doing that, it’s allowing me to learn about what it was I did do exactly. Because I’m not really sure what that was. [laughter] It brings me a bit closer to understanding the film. AH: Several years ago, very early on in my career, I worked for National Geographic, doing an interview show for them about the Middle East. At the time I was a TV presenter, hosting a music show on Israeli television. When the National Geographic people offered me this presentation job, I told them I would only do it if I could also direct. And they agreed. A man with a high position there came to talk to our crew and he said something that has really stuck with me. He was talking, in particular, about interviewing techniques and how to talk to people for the camera. Mostly people will just show you what they want you to see, the story that everybody sees. If you’re good, you might get to see some of their personal lives. And, once in a while, you might get to see their secret lives. The way he explained all this, I got the distinct feeling from how and what he told us, that you were supposed to steal these secrets, almost without them knowing. I knew he was right, that that’s what makes it interesting. But instinctually I didn’t really relate to it at all. There was something about it that didn’t click. AH: This is the very thing I picked up on when I first came to that place. I first went there to do a music video with Beirut and Zack Condon [their video, entitled, The Concubine, was shot partly on location in Bombay Beach in 2009]. That’s Mike [Parrish] Jr., Benny’s older brother, who stars in that video. You can also see Pamela doing the dishes and Benny and Sarah, as well, appear briefly. It was really hard to find the time to do this video and it was getting a bit frustrating, so I decided to go do a random location scout. A friend of mine told me about this desolate Salton Sea area. The first time we went there, I became so intrigued by the place, I had to go back the very next day. California was the place I learned to drive since I never learned in Israel. Being a really nervous driver, I never took the freeway; it just terrified me. I couldn’t do it. But I had to learn how to drive on the freeway to get to Salton Sea. H2N: The way in which a lot of the scenes were shot did make it seem like you were on some abandoned movie set. It did very much feel like a place unattached to the rest of the world, a universe unto itself. In my opinion, you really could have foregone the bit of archival info we learn at the beginning of the film about this place. While it’s interesting and the footage is delightfully kitschy, it’s really not that relevant to the stories you tell about the people living there. The dance numbers you stage with your protagonists, however, do feel quite organic; they might spring up out of nowhere at any given moment. It’s such a lovely, non-verbal way they’re able to express their feelings for one another. That’s one of cinema’s strengths, and, perhaps, why people love the music video format so much. Very early on in the process, I started editing as I was shooting. I’d edit and then I’d go back every few weeks to shoot more. This was my process for over a year—edit, go back, edit, go back. 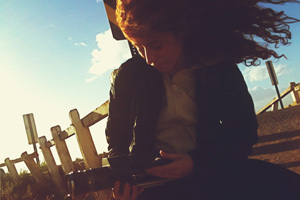 So even then, I was weaving the stories together as I was shooting them. I also knew where I wanted the dance sequences to be, based on what I was shooting. For example, there is the scene where a group of older kids are making fun of Benny, telling him he can’t participate in their games because he has “no class,” leaving him out completely. Then they went outside and played with those carts that later became a part of that dance sequence. After editing that scene together, the choreographer, Paula Present, and I rehearsed with them at the community center and we had them wear the same clothes that they wore that day and shot it over two days at the same time of day. So it really looks like they just stepped out to play and then started to dance. The gazebo dance with CeeJay and his girlfriend was shot more like a real scene, although a lot of their dialogue was improvised. I record everything with lav mics so I don’t really have to be that close to them all the time; I can just film and let them talk in a more intimate way. We were just finding things as we were going along. AH: I agree with you and I also deeply appreciate the deepness of their bond. It’s a very honest, but very kind relationship. She’s a mom that has energy and space left to explore the good parts of her children. She loves being a mother. She also feels frustrated and, in a lot of ways, stuck on certain things but she wants her children to have what she doesn’t, which is also something very much a part of the American character, to make sure your children might have a different destiny than the one of the generation before. That’s universal, of course, but the reward of that seems to be higher in people’s fantasies here. But despite her high hopes for her kids, she’s still the one who gives Benny his medication, insists on it, making sure he takes everything the doctors give him. Pamela does have a lot of problems dealing with his behavior and controlling it. He takes up a lot of her time and energy. But that’s parenting—you’re often the best thing and the worst thing to happen to your child. But, I don’t know too many people who just do good things all the time. The most important thing to give your child is love and acceptance because no matter what he has to deal with later, he will always have that. creative things together or I would help them out with certain things. One of the most interesting and intelligent interviews I’ve ever read. Wow! Was wondering if you know Marisa Silver, author of The God of War, the story, set in Bombay Beach, about a family similar to the Parrishes?